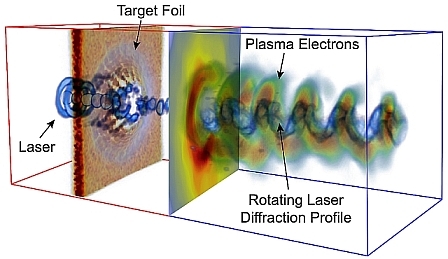 In a recent publication in Nature Physics [Gonzalez-Izquierdo et al, http://dx.doi.org/10.1038/nphys3613 ], a team of researchers led by Prof. Paul McKenna have discovered that diffraction of ultra-intense laser light passing through a normally opaque plasma can be used to control charged particle motion. The results have potentially important implications in the development of laser-driven particle accelerators and radiation sources (which rely on controlling the motion of plasma electrons displaced by the intense laser fields) and for the investigation of aspects of laboratory astrophysics. Plasmas transmit or reflect electromagnetic radiation depending on the wavelength of the radiation and the density of electrons available to respond to it – this is the reason why the ionosphere transmits visible light but reflects radio waves. At the focus of an intense laser pulse plasma electrons are accelerated to close to the speed of light, gaining mass due to Einstein’s mass-energy conservation principle. The heavier electrons cannot respond fast enough to cancel the propagation of the light, thereby making the plasma instantly transparent in the region of the most intense part of a focused laser pulse. The team have used this relativistic-induced transparency effect to create an instantaneous ‘relativistic plasma aperture’ in an otherwise opaque plasma. As the laser pulse passes through this aperture it diffracts and the plasma electrons forming the aperture are in turn displaced by the resulting intense laser diffraction pattern. This enables the spatial-intensity profile of the resulting beam of relativistic electrons to be controlled. It is demonstrated that the electron beam structure can be made to rotate and at variable rotational frequencies dependent on the degree of ellipticity of the laser polarisation. This leads to spiral-shaped, or twisted, plasma structures being produced. This control over the collective electron motion can be used to engineer electrostatic fields for ion acceleration and to drive secondary high energy radiation production. The helical magnetic fields induced using this concept could potentially be used in laboratory investigations of similar field structures in astrophysical jets. The experiment was performed using the Gemini laser at the Central Laser Facility, RAL and the simulations were carried out using the ARCHIE-WeSt and ARCHER high performance computers.